Microsoft has no more Lumia 950 XL warranty replacement units in the U.K. Speculation that Microsoft is planning to stop selling its Lumia handsets by the end of this year received a boost today from a report out of the U.K. There, a Lumia 950 XL owner was not allowed to receive a warranty replacement for the phone because Microsoft had no more inventory of the device to send out. The software giant had reportedly stopped producing the phone a month ago, and all remaining models were shipped to distributors. Eventually, all Microsoft warehouses will be out of stock although retailers have some units available. 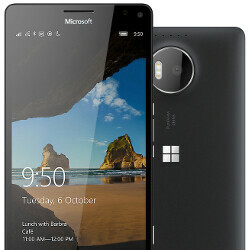 Microsoft never heavily promoted its first handsets to come with Windows 10 Mobile out of the box. While some fans of the platform had hoped that the new build could spark a turnaround and give Windows Phone some momentum, the app gap has proven to be too much for Microsoft to overcome. Windows Phone's market share continues to decline. At the time that the Lumia 950 and Lumia 950 XL launched last November, there was some thought that Microsoft was intentionally withholding support for the phones so that it could concentrate on building the mythical Surface Phone. But the truth is that Microsoft has a ton of Android related patents that add more to the top and bottom line than sales of Windows Phone devices ever did. Even if Microsoft were to walk away from selling handsets, the company does have some skin in the game. And if anyone wants a well-spec'd Windows 10 Mobile phone, there is the HP Elite x3 which is expected to launch in the U.S. on September 26th. Now that you've said it... Yes, I remember now... Microsoft can no longer use Nokia and Lumia names by the end of 2016... Thanks for the memory "Kick-Start" mate...! G'Day! can anyone tell me when the deal between Microsoft, HMD and FIH mobile will be completed??? By the end of 2016. You can assume 31 December 2016 maximum. I think HMD will release the phone after 2016. The app gap is not why shares are falling. It's because MS has retrenched and has stopped most of their activity with phones. They have also given people the perception they are abandoning phones so people are obviously abandoning the platform. The app gap has always been there yet the share rose pretty high at some points. There's actually more apps now than when the shares were higher because of uwp. Sure it's still an issue but I don't think windows mobile users ever relied on apps that much to begin with. So to state that's why shares are falling is kind of funny given the situation. The truth is money. Microsoft make money with Android but need to subsidies the Windows Mobile division operations. While Steve Ballmer is at the helm, he don't mind doing so even buyout Nokia to expand its operations. We all know what happened when Satya Nadella took over. He is not in favour of bleeding their cash flow for mobile platform dominant. Personally, I have trust issue with Microsoft so I would not invest in their gadgets despite I really need to depend on Microsoft enterprise software for work.